After last year’s onion experiment I have wanted to try a much larger variety of onions for 2017, and expand on the growing conditions. I started several varieties mid-November and a few more mid-December. I started the seeds with my usual method of using a small container to start with a high density until they are mature enough to separate and grow on their own. This works well given the finicky nature of onion seed germination. I now have far too many starts for the area I can grow them in – I’ll have to give some away. I used approximately the same number of seeds per variety but there are drastically different numbers of germination that you can see above. The ones with high germination came from Baker Creek and not only were the seeds good quality but they were not stingy, offering more than 5x the amount of seed for the same price as the seed I got from other places. As a rule this year, I want to take the volume of the fully grown onion bulb and have at least 3x the volume of soil. So for example, the largest, Ailsa Craig, the diameter is 6 inches which assuming a perfect sphere is 113 cubic inches, if the pot is 6 inches in diameter, the height would need to be 12 inches to get 339 cubic inches of soil. So the easy rule is to take the onion diameter for the diameter of the container and double it for the height of the container. Finding containers that fit that precise criteria is going to be fairly impossible, so I am going to custom make many of them in 5″ and 6″ diameters. The smaller ones can go into the standard 4″ square pots or some red 16oz Solo cups (with holes poked for drainage. The smallest ones I will plant in large bunches in larger containers. The custom made containers I’m going to make from heavy commercial landscape fabric. There are plenty of posts out there on how to make custom grow pots so I won’t elaborate in this post. The great thing is that they collapse down for easy storage, and are very easy to sanitize and reuse. Of course if you wanted to buy pre-made grow pots, they come in standard gallon sizes. The landscape fabric I linked to is less than $30 and is 3′ x100′. If I were to use the whole roll I could make 120 – 6″x12″ pots which would cost $0.25 each in fabric plus a few cents for thread. Each bag takes 5 straight lines of sewing, taking into account easy folding & cutting I could make 15-20 per hour. I am going to have these grouped in trays that will always have water in the bottom so they will not dry out. The water will wick up from the bottom to the roots as needed. One thing to note is that I am not making any distinction between long & short day onions in my selections. 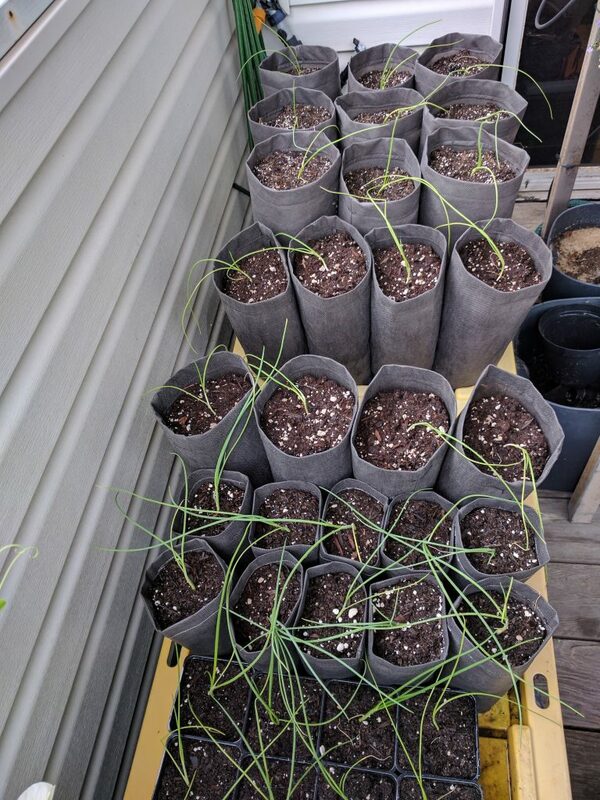 Since my climate is conducive to an extended growing period, I’m seeing if I can have the short day onions start to bulb out in April-May-June and then the long day onions to bulb out in June-July-August. That’s a range of roughly 120-180 days so we’ll see what happens. Update: I made the grow bags, and they take more like 6 minutes for each one if I’ve got everything organized. The 1″ distinction between diameter makes a huge difference in the resulting sizes. I was barely able to hem the 4″ bags on my sewing machine since they were so small. I thought they wouldn’t be very stable given the height, but the 5″ & 6″ bags are quite stable. The 4″ size can get knocked over pretty easily. 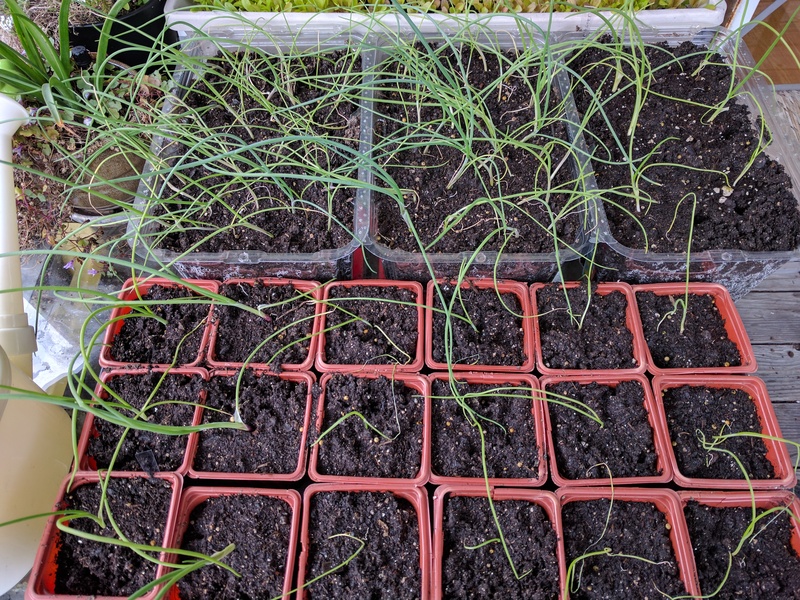 I wish I had more space for the rest of the onions I didn’t get to plant out, but I planted the extras all together in a small container to give to a friend so they’re not going to waste. 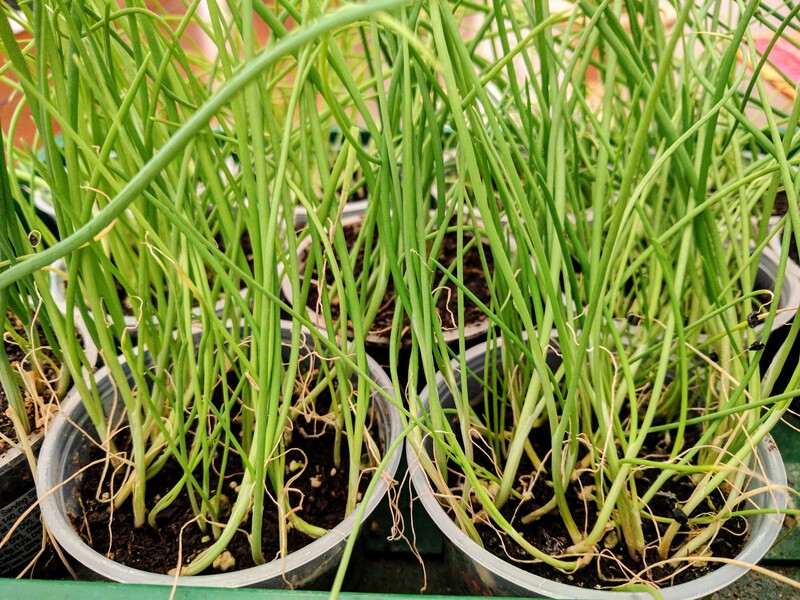 I’m really curious how the small 1″x3″ tall onions will turn out in their dense planting, and if I’ll be able to get full size onions in the grow bags.